Join us for a world-class training experience and you will be trained by global professionals with hands-on training on all modules. We have proven methods with a great track record and the approach we follow is the best in the industry. We work and train on the latest tools and technologies and our team of professionals keep themselves updated with the latest trends to make you best in-class. Do You Want To Learn How To Value A Small Or Main Street Business? The International Society of Business Appraisers (ISBA) Is The New Valuation Association On The Block That Fills The Gap So You Don't Feel Left Behind! Our goal is to provide you with the education you need to learn why and how ISBA is different from other associations. What sets ISBA apart from others? We are dedicated to upholding and promoting "best practices" to educate, certify, service and support professionals in the BUSINESS VALUATION profession. After all, there are roughly 28 million small businesses in the U.S., not to mention millions more worldwide. In the U.S. there are approximately 543,000 new businesses started each and every month! Take a look at ISBA's comprehensive educational courses to find out how you can learn to value a small to Main Street business. You will want to check back often for class dates, location, and information. ISBA provides its Members with an unsurpassed array of service, support, and tools. No puff, no hype, just outstanding benefits that you probably won't get anywhere else! Find out what you've been missing! What are the "best practices" of preserving the public trust for business valuation firms? 11 identifiable benchmarks are included in our evaluation. Find out how your firm can qualify for the Business Valuation Gold Seal of Trust. The exclusive "BCA Document Vault" is for ISBA Members. It is filled with news, FREE podcasts, tools, research, reference, and much, much more! Join ISBA today to gain access and realize the unsurpassed benefits. About our focus – leaving no business valuation professional behind. That means you have a direct hotline to others who hold sterling credentials who can help you when you need it. You won't have to wait until it is convenient for someone to contact you. We are dedicated and committed to course content that is up-to-date, understandable and comprehensive! We go the extra mile to teach you in a clear and concise way so that you know how to value a small or Main Street business. You will need data and tools for your valuation assignments. ISBA has an unsurpassed value proposition. Once you earn the BCA credential your learning does not stop! Each and every month, you will be invited to attend additional instruction FREE of charge via telephone conference. If you cannot attend the call will be recorded so that you can download or listen to the podcast at your convenience from the exclusive BCA Document Vault. We will even introduce you to the leading industry business valuation professionals who are your advocates developing course materials, continuing education, policies, procedures, reports and who steer the ISBA. 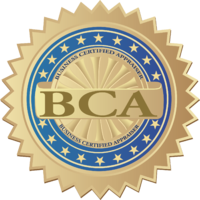 NOW Is The Time To Find Out How You Can Earn The BUSINESS CERTIFIED APPRAISER "BCA" Credential. Thank you! Your message is important for us.